The name McAllister is synonymous with the highest standards of pedigree sheep and cattle breeding. It’s a reputation that has been founded on the back of a tremendous commitment to sourcing the best genetics while, at the same time, applying the highest management standards. And where young stock are concerned, this commitment kicks in within seconds of birth. William and Elizabeth Mc Allister are the driving forces behind 200 elite Beltex, Charollais and Texel ewes. They farm near Kells in Co Antrim. The three flocks are all registered under the Artnagullion prefix. Significantly, every lamb born on the farm receives a dose of Provita Lamb Colostrum within 15 minutes of birth. “This helps them get up and get going themselves,” Elizabeth explained. “We have been doing this for the last 10 years. The colostrum powder is easy to mix and is very easy to administer especially in the middle of the night. 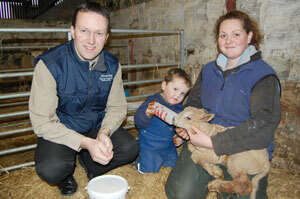 Elizabeth McAllister and her son James administering Provita Lamb Colostrum to a newborn Charollais lamb. The birth took place during a visit made by Provita’s Tommy Armstrong (also pictured) earlier this week. Every lamb born on the McAllister farm receives the colostrum within 15 to 20 minutes of birth. Provita’s Tommy Armstrong was a recent visitor to the McAllister farm. “Provita Lamb Colostrum has a rich consistency and is easy to mix, which is especially important during the night. In light of this the McAllister family consider the cost as being inexpensive s it is saving the lives of numerous lambs. “The current strength of the commercial market makes it all the more important for flockowners to keep as many lambs as possible alive.” Elizabeth also pointed out that the family had tried other colostrums in the past, but they hadn’t work as well. “The additional benefit of using Provita Lamb Colostrum over natural feeding is that we know the lambs have received a full colostrum feed quickly. In short, it gives us total piece of mind,” she concluded. For more information on Provita colostrum, contact your usual animal health supplier, call Provita on 02882252352 or contact Tommy Armstrong on 07720101444.